Olivier would be honored with six different orders and decorations over his long career. Let’s take a look at the honors he has received…..
An interesting ancedote about Olivier’s wardrobe that day. 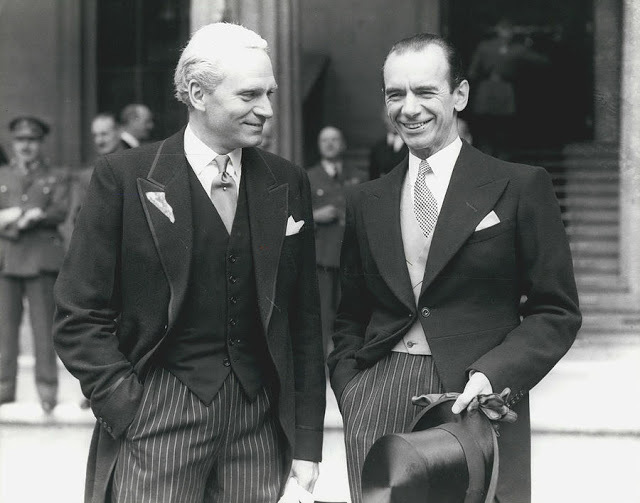 Vivien Leigh Legend reports that Olivier did not own a proper morning suit and had to borrow the waistcoat and the morning jacket. 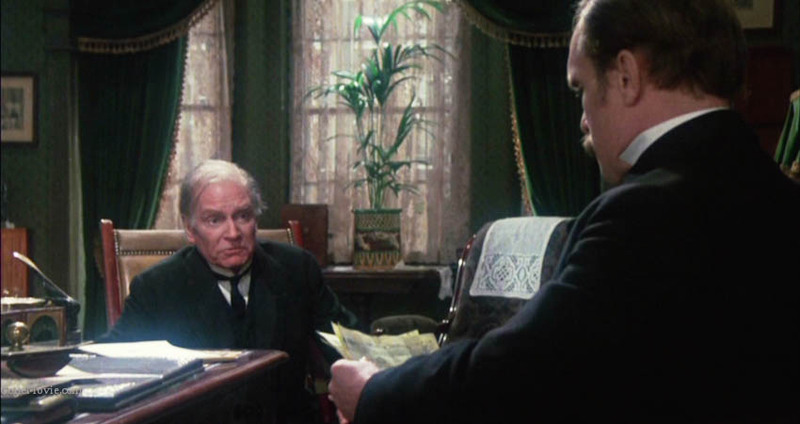 The waistcoast was loaned to him by Ralph Richardson, who had portrayed Dr. Watson in the 1954-55 BBC radio series to John Gielgud’s Holmes. On February 6, 1981, Olivier was honoured with the Order of Merit (OM) by Queen Elizabeth II. 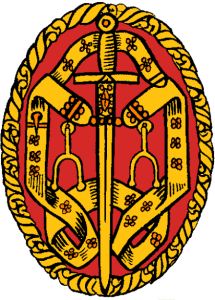 The badge is a gold crown from which is suspended a red enamelled cross. The center of the cross is blue enamel and is surrounded by a laurel wreath of gold. 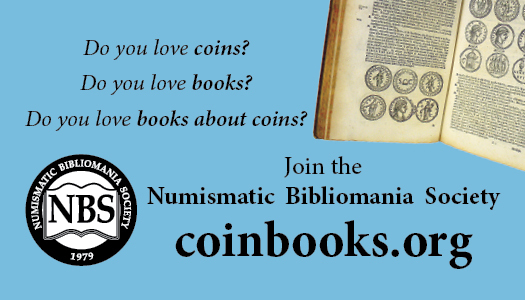 The obverse of the disk bears her majesty’s monogram with the reverse has the words FOR MERIT, both designs in gold. The ribbon is divided into two stripes of red and blue and is worn on a neck ribbon. In 1953, France appointed him as an Officer of the French Legion of Honour. 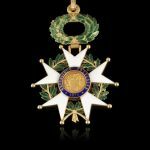 We have discussed the Legion of Honour before, in more detail, and you can read that post HERE. Also in 1953, Olivier was awarded the Grand Officer, Order of Merit of the Italian Republic (OMRI). This level is considered as second class, and is the third highest of the six different levels available. Created in 1951, by the President of the Italian Republic, it is the highest ranking honour of the Republic. 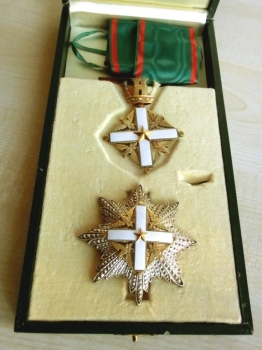 Awarded for “merit acquired by the nation, ” Olivier was awarded for his work in the field of the arts. The badge is a gold crown from which is suspended a white enamelled cross. The center of the cross features a gold five-pointed star. 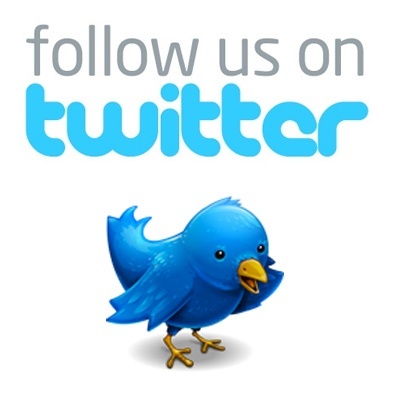 The four angles of the cross feature an eagle, in gold. The ribbon is primarily green, with a thin red stripe on each side and is worn on a neck ribbon. There is also a silver breast star and a rosette awarded with this level. Denmark honored Olivier with it’s Order of the Dannebrog, which dates back to 1671. There are six levels to this honor and Olivier was made a Commander, which is the fourth highest honor. 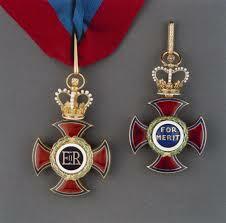 The badge features a white enamelled cross pattée with a red enamelled border, and is silver gilt. At the top of this cross is the royal cypher of the bestowing monarch crowned with the distinctive Danish royal crown. 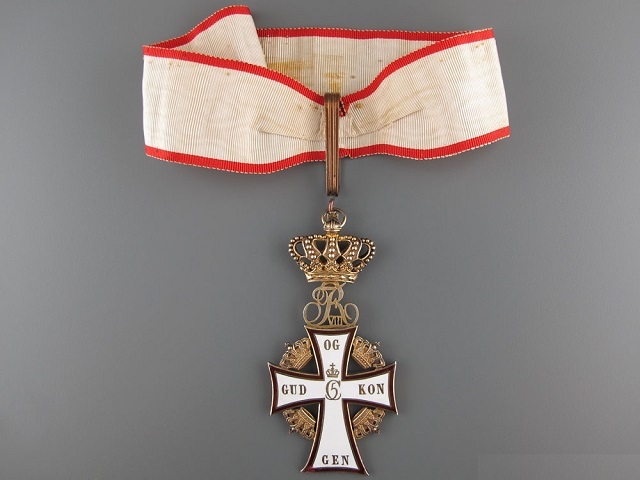 The obverse of the cross has the royal cypher of Christian V at its centre, as well as the motto of the Order: Gud og Kongen (God and the King) on its arms. The royal cyphers of Valdemar II Sejr, Christian V and Frederik VI, along with the years 1219, 1671 and 1808 (the years that each of them ascended the Danish throne) are featured on the reverse of the badge. A small Danish royal crown can be found in the four angles of the cross. The badge is worn around the neck, featuring a white ribbon with a thin red stripe on each border. The Order of the Yugoslavian Flag was the seventh highest of that country’s honors. Olivier was presented this Order, with Golden Wreath in 1971. The Golden wreath distinction makes this the second highest of the Order’s five levels. 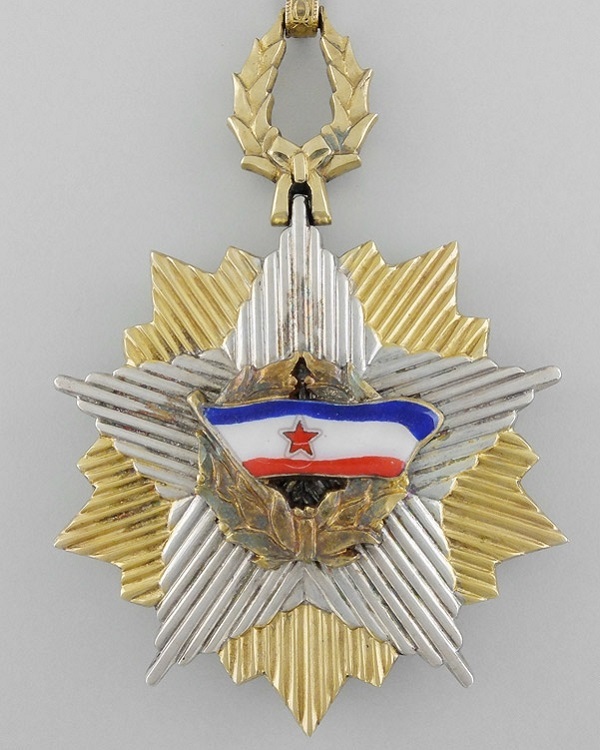 The badge features an enameled Yugoslavian flag within a wreath, upon a silver and gilded star. The order is suspended via a wreath. Worn around the neck, the ribbon is primarilly blue, with a thin white stripe and then a thin red strip on the borders.